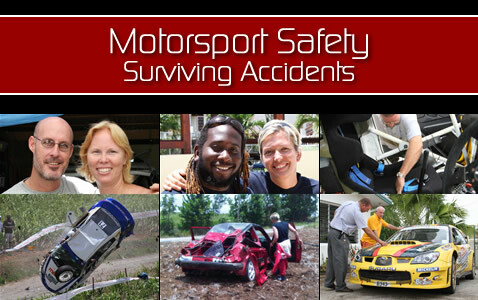 The Rally teams of Nicolas Gill / Susan Rogers and Dwane Jackman / Michaela Guscott both had major accidents during Rally Barbados 2010. In this article, they talk about their experiences and safety features of rally cars are highlighted with the help of Roger Skeete and Adrian Linton. Nicolas Gill & Susan Rogers rolled their Mazda 3 multiple times during the Shell V Power King of the Hill event held May 23rd, 2010 at Sailor Gully in St. Peter. The incident shocked hundreds of spectators who witnessed it. The accident would be all that people talked about for days as video footage and photos appeared on the internet. Fortunately Nicolas & Susan both survived and in this interview they discuss the experience of such a severe crash. After successfully completing the Shell V-Power King of the Hill event to get themselves familiar with driving on tarmac, Dwane Jackman and Michaela Guscott were looking forward to Sol Rally Barbados 2010. However, misfortune at 150 km/h saw them roll their Volkswagen Golf about 6 times at the end of the second run through the Canefield stage (May 29th, 2010). In this interview they talk about their Barbados experience and make some comparisons to rallying in Canada. Although motorsport can be dangerous, rally cars have many safety features that standard cars do not. In the following video, Barbados Rally Club scrutineer Adrian Linton takes a look at the Subaru S12 WRC of Roger Skeete, winner of Rally Barbados 2010. Adrian highlights some of the safety requirements which are examined before a rally. Nicolas Gill & Susan Rogers also give their perspective on how these safety devices protected them in their accident. Special thanks to the following people who made these videos possible.